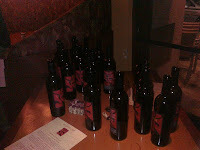 There was a wonderful winemaker dinner at Fabs Corner Cucina on March 21, 2012. This delectable event, hosted by Amelia Yokel, paired the Shai Cellars wines of Shawn Shai Halahmy with the food creations of Chef Ian Jerde. OMG. Now that I have that out of the way I’ll move on, starting with a little background. Fabs is a relaxed and friendly family owned restaurant in Sherman Oaks, California serving mainly Italian-based fare. One can get marinara-sauced or other lighter-sauced dishes along with other things such as Risotto del Giorno. More on the risotto later. There are always specials available which often distract one from trying items on the regular menu: the entrees, the soups, the salads, the appetizers. There are so many delicious choices and don’t forget the yeasty rolls. Got together for our monthly meeting of Wineaux of the Goddess at Fab's on 3/14 to do a blind tasting of Pinot Noir from all over the world. Turned out to be a very interesting and tasty evening! Pinot Noir is often described as being a difficult grape, to grow, to deal with in the winery, and to find truly great examples of, but fans are passionate about this variety, as sensually expressed by the dialogue between Miles and Maya in the 2004 movie Sideways. Difficulties plague Pinot Noir at every step, from propagation to its bottle-aging characteristics. Genetically unstable, the parent vine may produce offspring that bear fruit that is nothing like the parent's in the size and shape of the berry or cluster, and will frequently even have different aromas, flavors, and levels of productivity. There are 46 recognized clones (genetic variants) of Pinot Noir in Dijon, France. Experts estimate there are as many as 200 to possibly 1,000 clones of Pinot Noir worldwide. 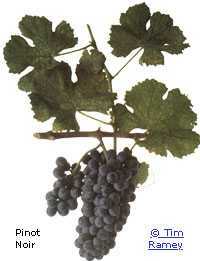 By comparison, Cabernet Sauvignon has only twelve identifiable clones. 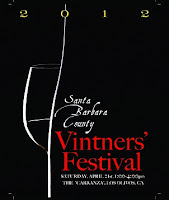 SANTA YNEZ, CA – The 100+ members of the Santa Barbara County Vintners’ Association will herald the arrival of spring and the beginning of the new vintage at their 30th annual Vintners’ Festival on April 21, 2012. The Festival will return to the Santa Ynez Valley on the pastoral grounds of “The Carranza”. “As the festival has grown over the past 30 years, we look for venues that not only will accommodate all of our vintners and guests, but that also showcase the stunning countryside that makes Santa Barbara County one of the most beautiful locations on earth”, states Jim Fiolek, Executive Director of the Association. “We’re excited about holding the Festival at “The Carranza”, a meadow tucked into a valley created by Zaca Creek as it leaves Foxen Canyon. We strive to move our venue to different areas every few years to allow our guests to see firsthand the many microclimates that support growing a diverse assortment of grape varieties.” The Carranza is located on Zaca Station Road between The Firestone Vineyards and Highway 154, northwest of Los Olivos, California. Well, we did it. We lived through the 2nd Annual Santa Clarita Wine Fest at the Bridgeport Marketplace in - you guessed it - Santa Clarita. It was a beautiful day, a large and friendly crowd and a group of happy VIP's hanging out in the evening. There were some challenges, but we met them head-on with smiles on our faces, and we got things squared away.